Krishna Mountview in Kausani is a quality Mountain resort that provides guests with a stunning view of over 300 km of the Himalayan Range. The hotel also offers comfortable accommodation in Kausani with luxurious facilities and efficient services. 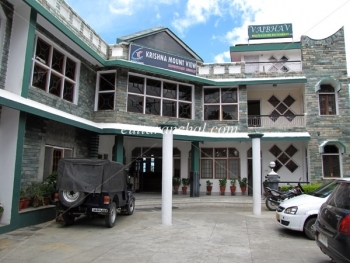 Hotel Krishna Mount View is located in the centre of Kausani City near Anashakti Ashram. It is just a walking distance from main bus stand and market of Kausani. The Krishna Mountview hotel has 35 spacious and comfortable rooms divided into 4 categories: Himalayn Suite, Family Suite rooms, Executive Room and Luxury Rooms. All rooms face the Himalayas and have a private balcony. In-room amenities include satellite television, direct dial telephones, and attached bathrooms with hot and cold running water. Room service is also available. Hotel Krishna Mountview Mountain Resort has a multi-cuisine restaurant called Vaibhav that serves wholesome food in Indian, Chinese, and Continental cuisines. The hotel also has a garden restaurant in Kausani. - Booking cancelled within 7 days of arrival date 50% of total booking amount will be charged as cancellation charges. - Booking cancelled within 4 days of arrival date, no show and early checkout 100% of total booking amount will be charged as cancellation charges.